I sure hope UFC light heavyweight king Jon Jones has seen “Rocky IV,” because he might soon have to be Rocky Balboa to Alexander Gustafsson’s Ivan Drago. 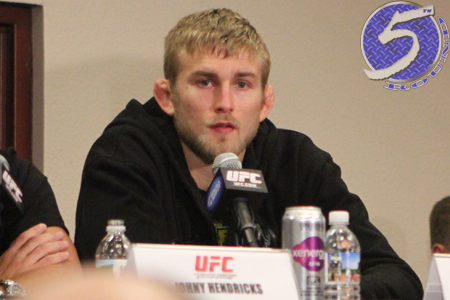 According to UFC president Dana White, the promotion is thinking about forcing Jones to rematch Gustafsson in Sweden. That’s right, the champ will have to enter hostile territory to fight the only man who has ever come close to beating him. White is likely referring to Sweden’s Friends Arena, which opened in April 2012. Capacity for soccer matches at the venue is 50,000, but could hold 65,000 for concerts, which is closer to the layout that would be used to hold an octagon. The facility has a retractable roof, so weather will not be an issue. What might be a problem is asking the champion to travel multiple time zones to defend his throne in someone else’s backyard. Would Jones be willing to give his opponent such a significant advantage? “Yeah, Jon’s going to agree to whatever fight we make,” White said. “What’s Jon going to agree? Where’s he going to want to fight? Seattle? White said the event will air live at their customary 10PM ET/7PM PT pay-per-view time slot, which means the show will be held at about four in the morning in Sweden. Sorry, Swedes. You can’t have your cake and eat it too (Unless you want cake for breakfast, and I’m not judging if you do). White didn’t give a timetable for when the much anticipated sequel will go down.